If you Google “Nobel Prize wine,” you’ll learn that Brian Schmidt is the only Nobel-winning winemaker. 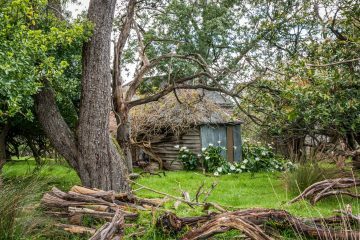 Schmidt and his wife own and operate Maipenrai in Canberra, Australia, and he shared the Nobel in Physics in 2011 for contributing to the case that the universe is expanding – work which, it’s fair to say, is mostly unrelated to making fine Pinot Noir. You’ll also find that last year’s laureates toasted to Taittinger’s 2008 Brut Millésimé, and that the menus of early Nobel Prize banquets favored consommé with Madeira and meats in red wine sauce. 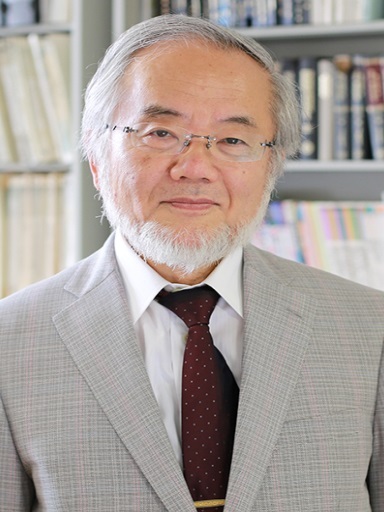 But if you think a bit about the Nobel Prize in Physiology or Medicine awarded this week to Yoshinori Ohsumi for his work on autophagy, you’ll find another connection. Sparkling wine made in the traditional method – or, if you’re French or want to pretend that you’re French, the methode traditionelle – employs yeast twice, for two different jobs. The first batch of yeast converts grape juice to the base wine in some kind of vat or tank. Those yeast need to be expert in converting sugars to ethanol. 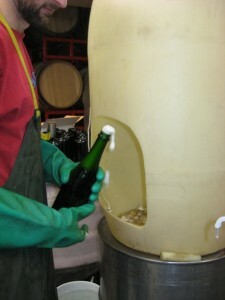 When they’re done, a human transfers the base wine to the sparkling wine bottle, along with some extra sugar and more yeast. Those yeast then convert that extra bit of sugar into carbon dioxide (and a bit more alcohol). Just as importantly, those yeast are responsible for much of the flavor and mouthfeel we appreciate in good sparklers. To do that latter job well, they need to be expert in a particularly organized form of dying called autolysis. Part of autolysis is autophagy, and explaining autophagy is what earned Ohsumi his Nobel. Autophagy – “self eating” – refers to a collection of mechanisms yeast use to recycle nutrients under desperate circumstances by digesting bits of their insides. Yeast cells use autophagy to deal with starvation and other stressful conditions. Several years ago a cadre of microbiologists and their microscopes caught yeast cells at the bottom of (full) bottles of Freixenet Cava in the midst of autophagocytosis. As it turns out, life trapped at the bottom of a bottle filled with very acidic alcoholic liquid at six times normal atmospheric pressure is pretty stressful. Autophagy is something akin to how your body digests stored fat if you go on a diet. I’d rather not take that metaphor too far, though, because in the yeast’s case self-eating is often a precursor to suicide. As scientists studying sparkling wine aging have observed, autophagy happens in conjunction with autolysis – “self splitting” – wherein yeast cells produce enzymes that break down their cell walls and membranes. Dead and strategically decomposing yeast bodies build up in the lees that settle in bottles of sparkling wine undergoing their second fermentation. And as a result of all of this very active dying, sacrificial yeast cells release molecules that add desirably “yeasty” flavors, smooth out astringency, add body, and improve mousse stability in sparkling wines aged sur lie. But why is any of this important, beyond finding a way to connect Nobel Prize-winning science to winemaking? Though Ohsumi conducted his original autophagy experiments with Saccharomyces cerevisiae, he won the Nobel in medicine because human cells self-digest in essentially the same way, and hiccups in that process are behind all manner of diverse diseases from Parkinson’s to multiple forms of cancer. Of course, in addition to pointing toward better treatments for human disease, connecting autophagy to sparkling wine quality points toward new and potentially improved sparkling wine yeasts. Apart from dampening perceptions of fruitiness – which could be seen as a good or a bad thing – autophagy and autolysis are positive events for sparkling wine quality. (Whether they’re positive events for the yeast is a different matter, and I’m not sure that anyone’s asked them.) The sparkling wine industry might, in short, benefit from yeast that die better. One of the difficult things about fitting that bill is that full and final yeast death takes a really long time. Autophagy starts happening within a month of sparkling wine first being put into the bottle, and microscopic changes to dead and dying yeast cells are still happening up to six years later. Maximum activity seems to happen about two years into the process. 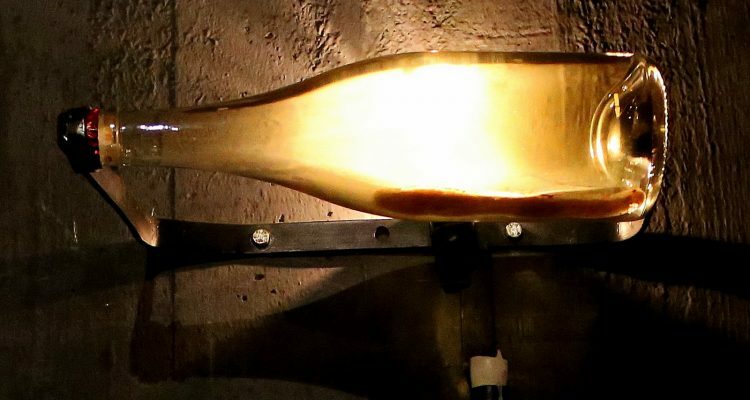 Science thus weighs in favor of giving sparkling wine a nice, leisurely secondary fermentation, and knowing what happens over those years should help winemakers think strategically about where their bubblies spend their time. Finally, scientists have been tracking the chemistry of how sparkling wine evolves since the 1960’s. Having a microbiological explanation to back up the chemical evidence is satisfying. Cheers for that, Dr. Ohsumi. That’s what one of the newest Nobel Prizes has to do with wine. But maybe a more interesting question is: if the Stockholm stable included a Prize in wine research, who would win? Any nominations?